Categories: Entries. 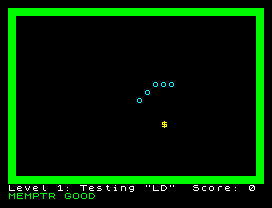 Tags: clone, great controls, Spectrum 48K. Categories: Entries. 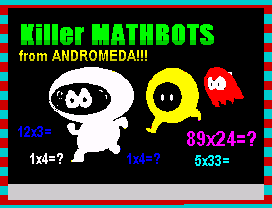 Tags: edutainment, maths, science, Spectrum 48K. Categories: Entries. 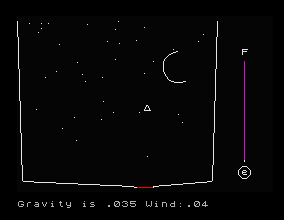 Tags: Spectrum 48K. Here we have a pure survival horror genre game. A exploding mine sends you thru time and space (we all know that exploding mines tend to do such a thing). When you open your eyes you find yourself confined inside four walls (whether there’s a ceiling or not it’s not specified) with five angry looking aliens chasing you. Why such aliens respected you while you were sleeping is uncertain, though. With no weapons, all you can do is scape. Well, you can also use harsh language at will. The game comes with a neat tune you can’t skip (even though the screen is captioned with a message telling you to press C to start) for higher crap factor. 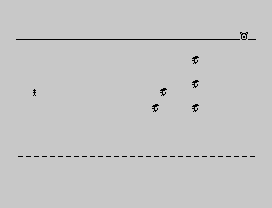 The graphics are tiny and dull, but, to be honest, I never witnessed a better rendition of an alien in 8×8 pixels. Good job!